The motorman sounds his gong twice. He gives a small brass handle a twist with the right hand and cranks a massive apparatus clockwise with his left. His bright yellow trolley, of 1904 vintage, starts forward down a country trolley line that's been running continuously since 1900. The car rounds a curve. A groundskeeper is tending to the flower bed. 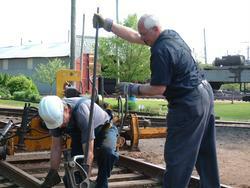 Trackworkers are replacing wooden ties and steel rails in the train yard, driving their spikes with heavy hammers. Passing by the car shop, the motorman knows hard work is at hand within. 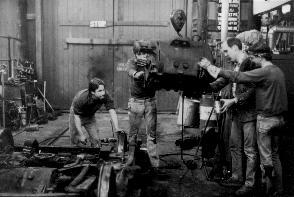 A woman meticulously paints the exterior of a 70 year old streetcar, while a gang of men hoist a thousand pound electric motor into the air. Out in the yard, cars of all types are being hostled about, from tiny 4-wheeler trolleys to mammoth subway cars. Heading off into the woods, the motorman nods to the signal maintainer, head buried within a complex network of electromechanical relays, and to a line worker high above on the overhead wire. Crossing an old narrow-gauge railway and a small stream, the car reaches the end of its journey in the little village of Short Beach, and there the motorman tells his visitors a story. You see, this is not 1900, or 1920, or even 1970. This is now, and all of the people you have met thus far, as well as countless others back at the station, in the exhibits gallery, in the office, and in the library, are all volunteers. They are all part of living history, preserving the heritage and artifacts of the electric streetcar and transit industry. You could be one of them. Volunteering at the Shore Line Trolley Museum is a great way to meet new people of like interests, to acquire new (and often centuries-old) skills, to learn about history, culture, economy and technology, and, just maybe, to do something a little different as an escape from your daily routine. Since its inception in 1945, our museum has been a volunteer-driven organization. There are over 1000 current members, many of whom are active volunteers in everything from running cars to restoring them to working on the tracks to tending the grounds. No professional training or previous experience is required; the museum's training department provides thorough, hands-on instruction. Shore Line Trolley volunteers come from near and far. Volunteering is for everyone; our volunteers range from 8 to 80! Although some of our volunteers contribute hundreds of hours each year, even volunteers with just a handful of hours are appreciated and recognized, through our newsletter, and our annual tabulation of volunteer hours. While the museum has scheduled public operations on about 140 days out of the calendar year, volunteers can be found on the property all year round. Have irregular days off? We can accommodate your schedule. There are even volunteer opportunities of which you can take advantage at your home or office! The Shore Line Trolley Museum is a nonprofit, educational institution that is recognized under section 501(c)3 of the IRS tax code. That means that not only are your contributions of goods and funds deductible, your travel, meal and lodging expenses may be as well (always consult your tax advisor). Our volunteers apply a set of skills both broad and deep to meet a variety of challenges. Although some of the tasks and skills described below might seem intimidating, remember that most of our volunteers do something completely different in their "day jobs". We don't require previous experience of any sort. Our training department provides a program of "continuing education" to broaden and sharpen our volunteers' skills and knowledge. You'll soon find yourself doing things you never thought possible! Our most heavily patronized volunteer activity. Becoming a trolley operator requires 4-5 full days of training in safe and proper operating practices, historical background, and techniques for working with the visiting public, and passing a written and road test. You must be 18 years or older to operate cars for the public. Additional volunteer opportunities exist for all ages in the positions of museum guide. In the Public Operations Department, you'll have contact with a diversity of visitors of all ages, backgrounds and interests. You are our face to the world, and make a lasting impression on thousands of people each year. One of our greatest assets is information. In the over fifty years that our museum has been in existence, we have amassed an impressive collection of information in the form of texts, photographs, drawings and oral histories. Our research department catalogs, organizes and explores these materials and produces various publications, from in-house training guides to books and journals to online works. Being a Library Researcher demands good writing, computer and communications skills and a quest for knowledge and exploration. Volunteers in the shops department maintain and restore our vintage vehicles. They perform routine and corrective maintenance on the fleet, such as checking and lubricating bearings and journals, inspecting and servicing controllers, traction motors and brake systems, trolley poles and bases, interior and exterior cleaning and paint touch-up, and even changing light bulbs (it's a little harder than you might think!). Car Restoration entails a wide range of tasks such as patching deteriorated wood and metal, fabricating mouldings, surfacing, painting and stenciling, machining and casting missing components, installing floors and roofs, restoring seats and windows, installing and repairing air piping and electrical wiring, overhauling air compressors, traction motors, trucks and wheelsets. The Track Department is literally the foundation of our museum. Track Workers install and renew the track. They perform periodic inspection and replacement of the wooden ties, spike and tamp, design and lay new sections of track, inspect and adjust gauge, switches, guardrails and automatic curve lubricators. They maintain the subgrade, ballast and drainage systems. Track is an outdoor sport, physically demanding and often involving heavy machinery, the perfect antidote for a desk job! Exhibit department volunteers design and install new exhibits and maintain and improve existing ones. They have a keen sense of information presentation and audio-visual design and pride in their fine craftsmanship. Some exhibits are static displays, some are dynamic and interactive, some are hands-on and some behind glass; there are even online exhibits. They all combine to make our visitors' experiences educational and entertaining. Line refers to the overhead trolley wire which delivers power to the cars, as well as the line poles, brackets, span wires, insulators, hangers and other hardware which supports the trolley. 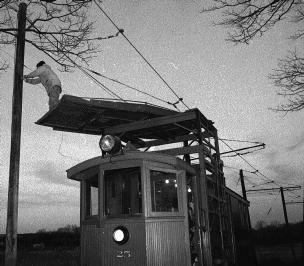 The trolley wire is 15-20 feet above the track, and is energized with 560 Volts, D.C. Line work is sometimes performed with the wire "live" via a special trolley car with an insulated working platform. 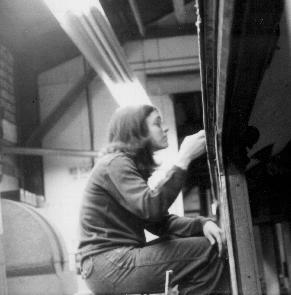 Working in the Line Department affords breathtaking views of our scenic line and some challenging lessons in geometry and physics. It's an experience that can't be topped! Signal Maintainers carry on the heritage of railway signaling and install, upgrade and maintain the signal system which provides vital traffic control functions. Signal maintainer is a multi-disciplinary job, involving anything from changing light bulbs to to hoisting heavy equipment to painting to complex electrical calculations. Maintainers work in pairs to check each others' safety-critical work and the highest standards of craftsmanship must be upheld at all times. The Comm/Signal Department works in conjunction with Track in bonding rail joints and special work for signal and traction current return, and protecting switches, and with Line to install and maintain overhead cabling. The Comm/Signal Department is also responsible for the railway telephone, radio, and public address systems. Our buildings shelter the collection from the elements and provide indoor exhibit space. Maintenance of these valuable resources is an essential part of museum operations, and our Buildings and Grounds Maintainers get it done. From hanging huge doors to painting to lighting design, almost anything is fair game. They also keep the museum safe and attractive by maintaining the landscaping, weeding the flower beds and keeping the walkways clear. There are so many other valuable services that museum volunteers provide that space simply isn't sufficient to list them all. If you're not already a member of the Shore Line Trolley Museum, Sign Up!. Then call the Volunteer Support Department at (203) 467-6927, or email volunteer@bera.org. One of our volunteer coordinators will talk to you and match your interests with ongoing projects. You'll also receive our periodic Volunteer Bulletin via email We look forward to working with you.